It’s no easy task keeping a business or institution secure from unauthorised access. Mechanical locking systems are cumbersome to administer and become entirely untenable once an organisation grows beyond a certain size. A centrally administered security system with networked access points can help. Yet as anyone who has ever tried to get every single door onto an IP network quickly realises, this approach has its own challenges and limits — both financial and technical. 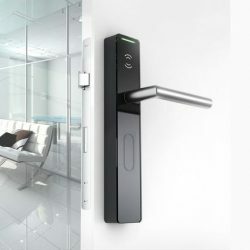 Electronic locking systems with door terminals and electronic cylinder locks have become a viable alternative. These components work offline, eliminating the need for network connections, and can be installed into existing facilities, typically at reasonable costs and without requiring major structural changes. They are outfitted with long-lasting batteries that require changing roughly every 30,000 activations, so no power cable is needed. The result is a flexible way to secure storage rooms, offices and even individual cabinets. 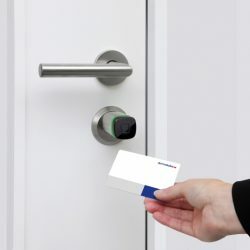 Yet how do these door locks and terminals know which credentials are current?